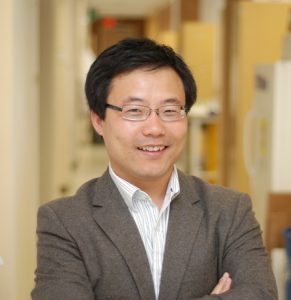 Dr. Weian Zhao is an Associate Professor at the UCI Department of Pharmaceutical Sciences, Sue and Bill Gross Stem Cell Research Center, Chao Family Comprehensive Cancer Center, Edwards Lifesciences Center for Advanced Cardiovascular Technology, Department of Biomedical Engineering, and the Department of Biological Chemistry. Dr. Zhao is also the founder of Velox Biosystems, LLC and Baylx, Inc, start-up companies that aim to develop rapid and sensitive diagnostics and stem cell therapeutics, respectively. Dr. Zhao’s research aims to elucidate and eventually control the fate of transplanted stem cells and to develop novel miniaturized devices for disease diagnosis and monitoring. Dr. Zhao has received numerous awards including the MIT’s Technology Review TR35 Award: the world’s top 35 innovators under the age of 35 and NIH Director’s New Innovator Award. The Zhao Lab is dedicated to developing novel bioengineered tools to address unmet biomedical needs and biological questions, and to quickly translate them to the clinic to help patients. Through working at the interface of pharmaceutical sciences, biomedical engineering, biology. and medicine, The Zhao Lab’s interdisciplinary and collaborative team aims to develop next generation stem cell-based therapeutics and miniaturized diagnostics. “UCI stem cell therapy attacks cancer by targeting unique tissue stiffness,” UCI News. July 26, 2017. “UCI receives up to $5 million to advance bloodstream infection detection technology,” UCI News. April 30, 2015. “UCI team develops test to rapidly diagnose bloodstream infection,” UCI News. November 13, 2014.